It’s the same ol’ dull routine each time I phone. Poor George has been bludgeoned by the force that is our family for nearly twenty years. 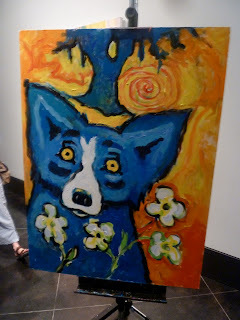 I first met George Rodrigue when I was twenty, an Ole Miss sophomore with little more than the next party on my mind. He was, and remains, unintimidating, as he rendered me effortlessly on a wine-stained cocktail napkin. It wasn’t long before George began accompanying my sister on our Wyoming family vacations and showing up on the New Orleans West Bank at my Grandma Helen’s for Christmas. Clearly this was serious torture that my own future husband endured simultaneously. I started thinking that this guy might be serious about my sister. Sure enough, they married, and my sister inherited two boys, an old lady, and a French, wannabe Don Juan named Romain. So I packed a bag and visited the honeymooners in Lafayette. What I found startled me. My independent, savvy sister wore her apron like a badge of courage as she cooked and gardened relentlessly. Honestly, I never knew she could make anything other than tacos and tuna salad. Who’s Your Mama? Are You Catholic and Can You Make a Roux? (Marcelle Beinvenue) became her Bible, as she heeded our mom’s only homemaking advice: “If you can read, you can cook.” Chocolate cakes and red beans and rice quickly vanished as teenage boys clambered through the kitchen. 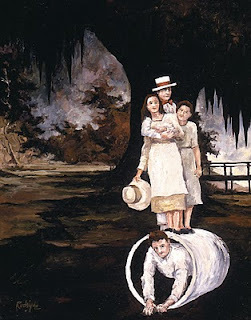 I felt like an outsider in this odd house of boys, and I wondered if my sister shared similar feelings. 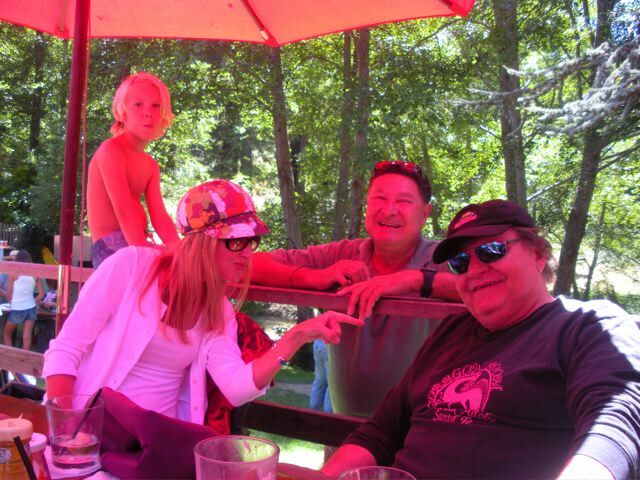 How was I to understand these testosterone laden people who were taking my sister away? We sat for hours discussing Star Wars, André and I both anxiously awaiting the prequels. I listened rather clueless to his many concerns about China. He shared his interest in war history. As an Art History major, I shared my descriptions of artists such as Delacroix and Leutze, who painted history for me. We became friends. In the years since my fleeting moment of boredom in Wendy’s Lafayette kitchen, the honeymooners’ booming business moved them to New Orleans. 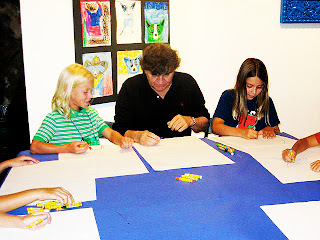 Jacques earned a law degree and operates the thriving George Rodrigue Foundation of the Arts. 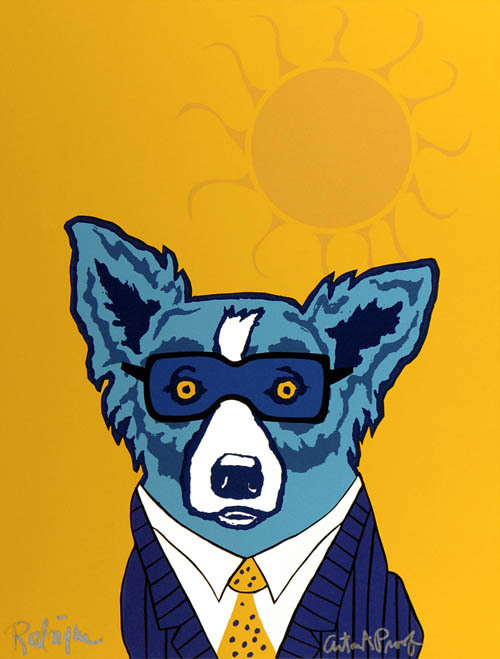 André continues to pursue knowledge in all forms, and is known as a won-ton whiz at his Lafayette restaurant, the Blue Dog Café, co-owned with his brother. And, as luck would have it, my husband and I were blessed with two boys. 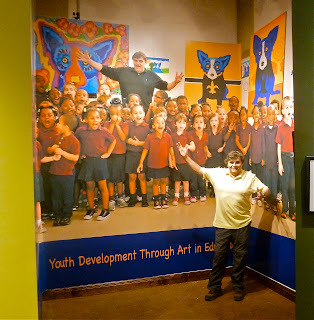 My boys are visiting Aunt Wendy and Uncle George this week, attending art camp at the Foundation while my sister and I plan our 4th of July festivities and she completes tasks for the upcoming Baton Rouge exhibition. Because we want her to play by the pool and join us for an airboat ride, I’ve attempted to lighten her load with this post. Please don’t hold it against her. Another hot summer, this one spent unexpectedly in Houston, Texas, finds us missing our annual cross country drive once again. 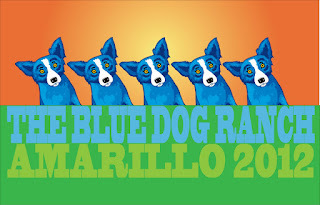 Unlike last year's Louisiana exhibitions, however, this year we look forward to Blue Dogs in Texas, opening August 10th at the Amarillo Museum of Art, continuing until October 14, 2012. Contact the museum for programming. It is one hot summer, and for the first time in twenty years, George Rodrigue and I remain in Louisiana throughout the steamy months. Most years we hit the road in our truck, driving west. We used to say that our vacation starts the minute we cross the Texas border into New Mexico; but we’ve softened on that point, falling in love with the Lone Star State. 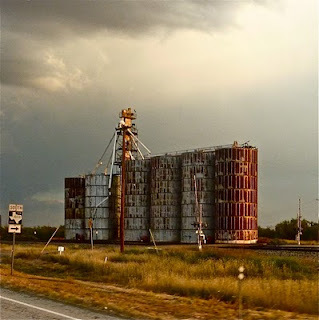 Fort Stockton is now a destination, and tradition insists that I drive the long stretch between Wichita Falls and Amarillo, so that George is free to photograph the grain silos and the cattle. 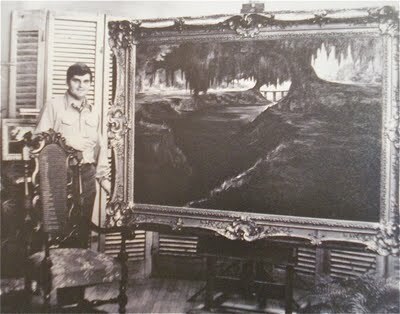 This year we only dream about those drives, tied to Louisiana for a yearlong statewide traveling museum exhibition of George Rodrigue’s paintings, sponsored by the New Orleans Museum of Art. 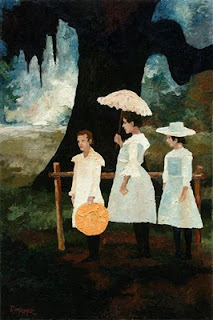 This involves many events, including lectures, painting demonstrations, children’s workshops, receptions with the artist and more, with the next round beginning late July at the LSU Museum of Art in Baton Rouge. 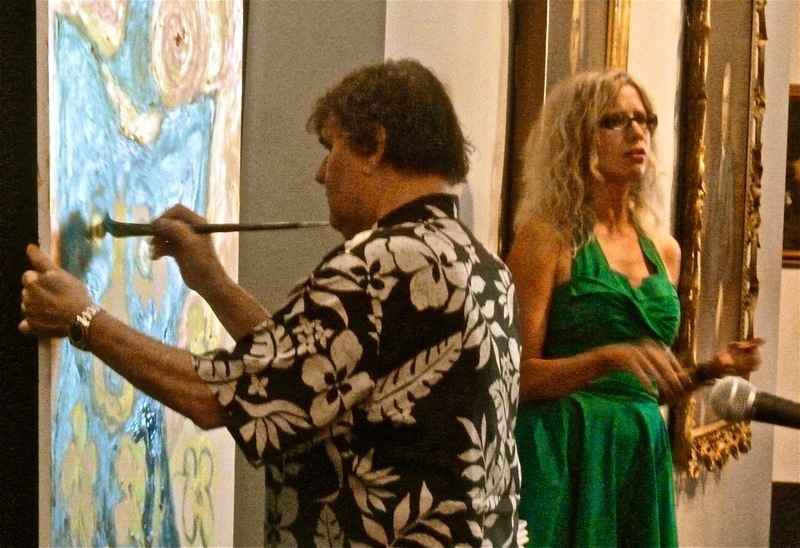 (See the bottom of this post for a schedule of events; for details from the recent painting demo in Alexandria, pictured below, visit here. Click image to zoom). I wrote a blog this week for Gambit, the New Orleans weekly paper, about the "Summer of Love," about heartbreak and true love, revealing probably way too much of our personal lives, and yet blending easily into the universal. In New Orleans, people rarely complain about the heat. We women don sundresses, and the men break out their seersucker. We carry fans to parties, sweaters to heavily air-conditioned movies, and koozies just in case…. We also visit with family. My sister, who lives in Tallahassee, Florida, runs a summer camp for her boys, constantly making plans for them over the hot months. 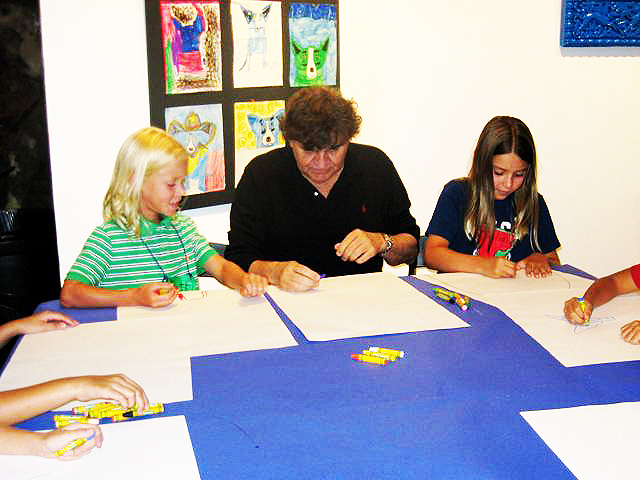 Last year they visited us in Carmel, California, where they painted and goofed off with Uncle George. This year they arrive tomorrow to attend the “Made in Louisiana” art camp sponsored by the George Rodrigue Foundation of the Arts. Happily, George agreed to surprise the class with some one-on-one instruction periodically over the week. 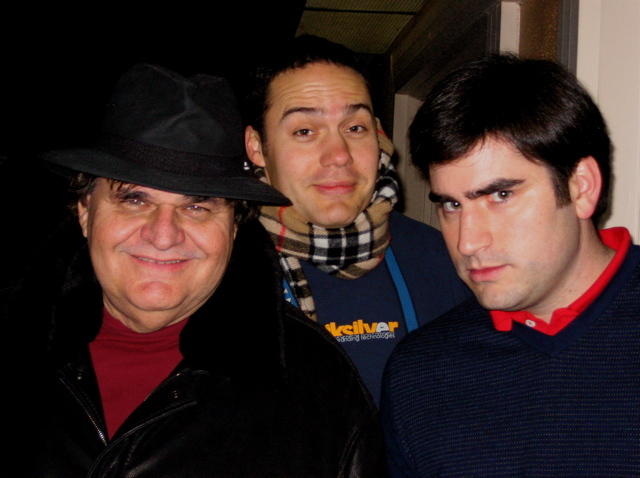 Our nephews remain through the Fourth of July, my father’s birthday. 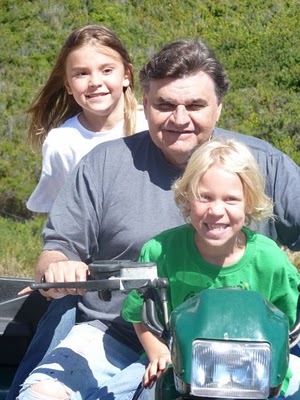 I just wrote about him too (story here), and well, it’s important that he enjoy his special day with his children and grandchildren. So, my apologies ahead of time, but you may be stuck with a re-post of something ---maybe Texas--- next week. And George? Oh he’ll hang out at the pool with us some. But mostly he’s thinking about his art and upcoming shows. 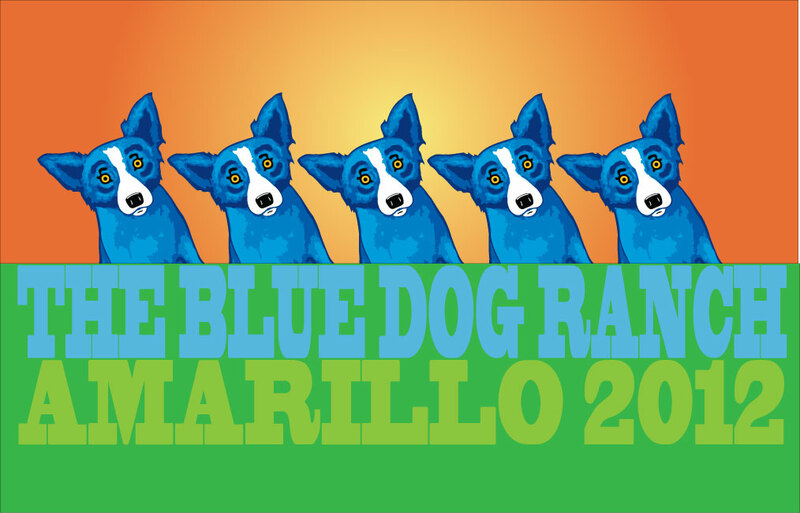 Although unconfirmed, we have a fun one in the works for late 2012. George Rodrigue rarely speaks of his father. I’ve written before about his construction and tomb business, as well as peripheral facts regarding his Cajun heritage. But even when pressed, I had a hard time pulling personal information about Big George from his son. As I suspected, George struggles with these memories, and he stared in the distance and spoke slowly, obviously distressed. I strained to hear him over the music in his studio, but he protested as I moved to turn it down, saying that Johnny Cash and “Luther Sang the Boogie” helped him with the past. “Mama called him Daddy and everybody called me Baby George. 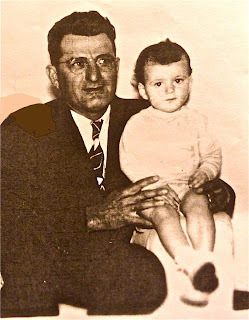 To the town my daddy was “Big George,” not only because we shared a name, but also because he had huge hands and was big and strong. 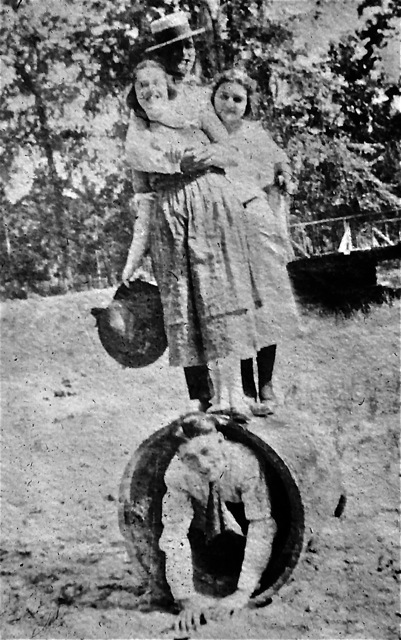 One cousin remembers my daddy lifting the back of a Model T Ford off of the ground. “He quit school in the 6th grade to work with his father, who also was a bricklayer. My daddy was a pitcher for the New Iberia baseball team. 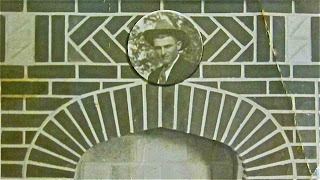 “He was what they called a Master Mason, because he built fireplaces and designed brick boilers for the sugar mills. He was an artist in his own right, and he built his reputation on that. 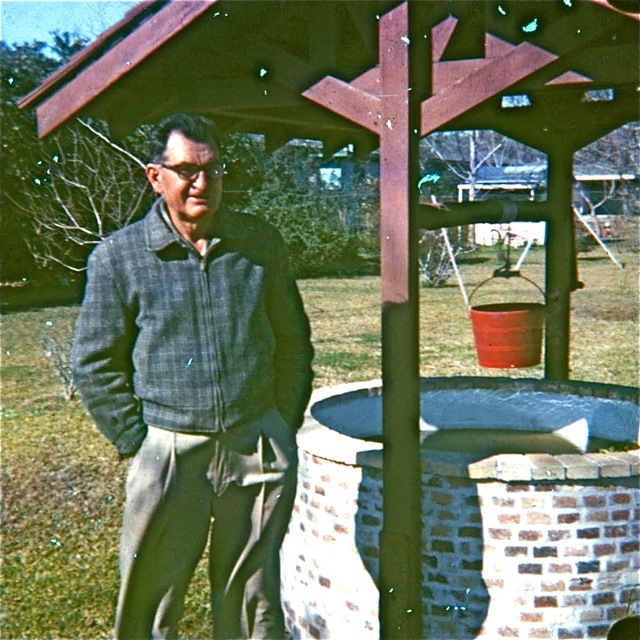 “My daddy surprised her when a master carpenter designed an elaborate roof for the wishing well. She screamed about the expense and they fought bitterly. But she got it anyway and everyone, including her, enjoyed it. We had tadpoles and two frogs, and then we let them go. We tried out goldfish, perch, and all sorts of minnows. 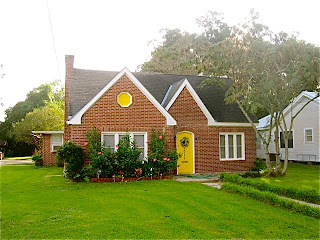 (Note: It’s because of this well, I believe, that George will never sell this house. He painted it many times, such as this beautiful interpretation of Evangeline). “I was in the 8th grade when Daddy got sick. They took me to the hospital in Lafayette and told me that he would die. But when I woke in the morning in the waiting room, they said he made it through the night. My mama sat clicking her rosary beads. She thought it was a miracle. But George, I pressed, what was he like as a person? Tell me about his personality, his beliefs. What kind of man do you remember? He sat quiet for a long time, his mind elsewhere, recalling a father he never really knew. Finally he shared the random stories, the bits and pieces he found in his mind. “Others told me that he laughed and told jokes. “He and my mama traveled throughout south Louisiana looking for bricklaying jobs for twenty years until they settled in New Iberia. “When the street fair came to town, he knocked the bottles from the shelves with three balls. He won so many prizes that they banned him from the fair. But he changed his clothes and hat and returned, disguised, to play again. That was long before I was born. Tell me that story again about when you went fishing. “After his surgery, he couldn’t work. Mostly he sat bored in the house. So we went fishing. 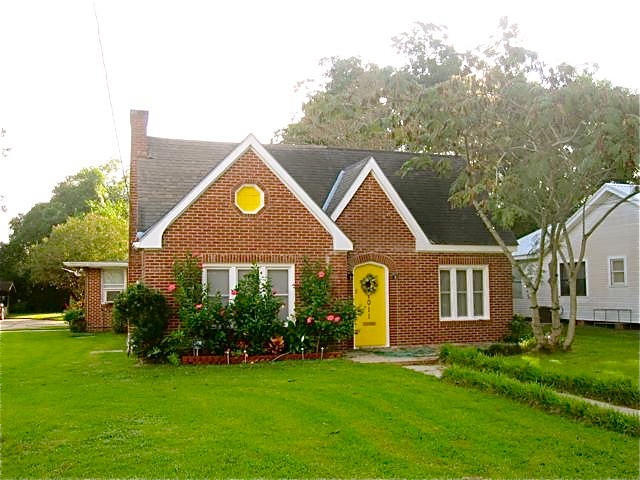 We found all kinds of places in south Louisiana, some private, some paid, and some on the levee." 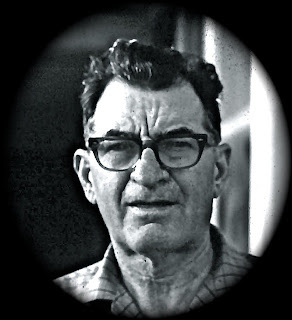 “It was important to him that I never pick up a brick. He said it over and over. He wanted me to do something else. When I started drawing, he forbid me to be an architect. I like to draw plans, but he hated architects, because he said that they only know how to draw stuff on paper and not how to build, not how to make it a reality. “He left fireplaces, houses, walkways, all things people still use. And I guess that’s his legacy. 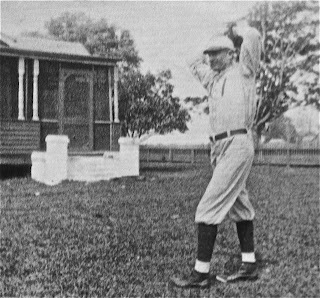 He built my uncle’s house, my cousin’s house, and two houses for us. 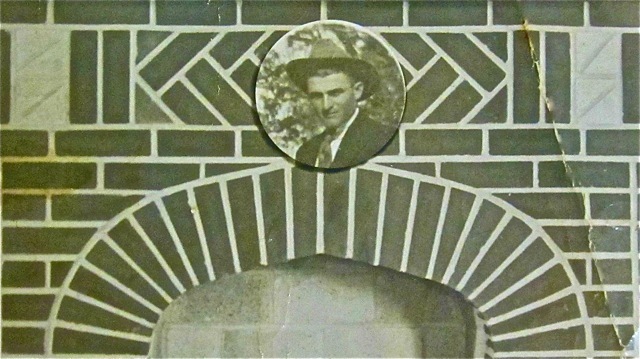 "I watched him build fireplaces and complicated steps. He never finished school, but he had a book for his figures. To do that kind of work involved a lot of math, and I guess he taught himself. 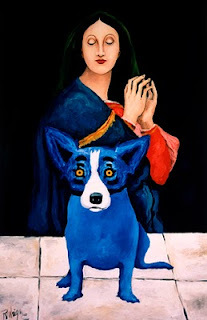 For a related post see "How Baby George Became an Artist"
From his earliest commission, a valuable lesson at age fifteen when the funeral home director Mr. Burgess refused to pay the agreed-upon fifty-dollar price for his portrait, George Rodrigue tossed around the pros and cons of outside projects. Everyone has an idea, most well meaning but ill advised. Human nature requests the obvious, and George understands as well as anyone that nothing happens without trying. Ultimately it is George, however, who faces decisions based on his concept of ‘legacy,’ whether artistic, financial, cultural, societal, familial, philanthropic or otherwise. It is up to George to remain true to his vision. 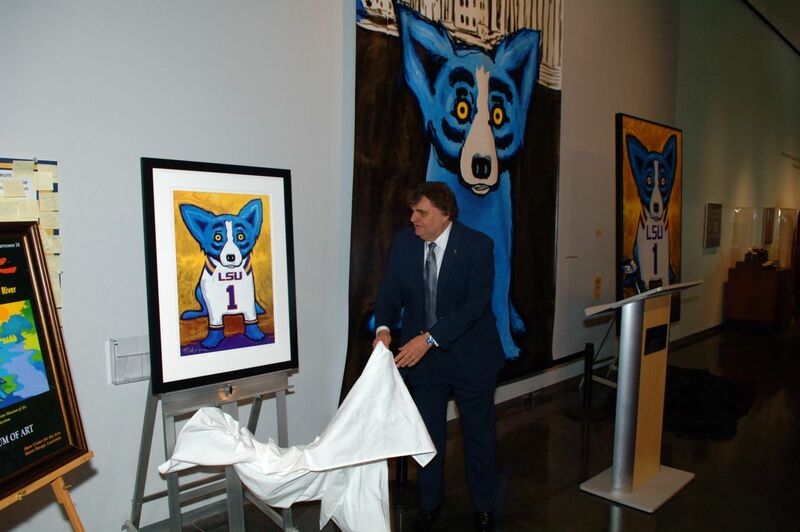 But every once in a while a plan comes along that enhances not only George Rodrigue’s long and short-term goals, but also those of others. 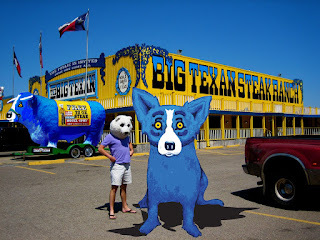 Of course he thought in the past of painting the Blue Dog wearing an LSU jersey; however, he worried about his image, about endorsement and commercialization. “It didn’t take a brain surgeon to figure out that the jersey was perfect.” – G.R. That nagging concern, ironically, resulted in a fund-raising phenomenon in 2003, when a group of LSU students, including George’s son Jacques Rodrigue, showed concern for their mascot’s living conditions. They approached George for help, hoping for a related Blue Dog print. 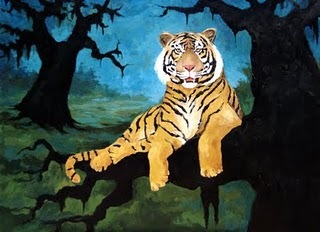 George, however, painted Mike The Tiger. He avoided using the Blue Dog, because his gut told him to wait. 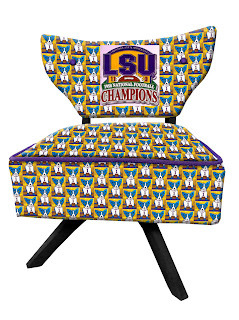 In hindsight, it was a good call, and sales from prints of Mike the Tiger raised more than $1 million, building Mike a large and elaborate habitat on the LSU grounds. Yet George, a huge LSU fan, knew he held a prize, an image of the Blue Dog that not only appeals to thousands of LSU students, alumni, and fans, but also benefits, through our foundation and others, thousands of Louisianians, whether connected to the university or not. “The excuse to finally produce this print comes from raising money for an important cause, money we can put to great use immediately.” – G.R. In 2011, George Rodrigue teams up with the Tiger Athletic Foundation (TAF), The Louisiana State University Museum of Art (LSU MOA) at the Shaw Center, and the George Rodrigue Foundation of the Arts (GRFA) to raise money for education and the arts in Louisiana. 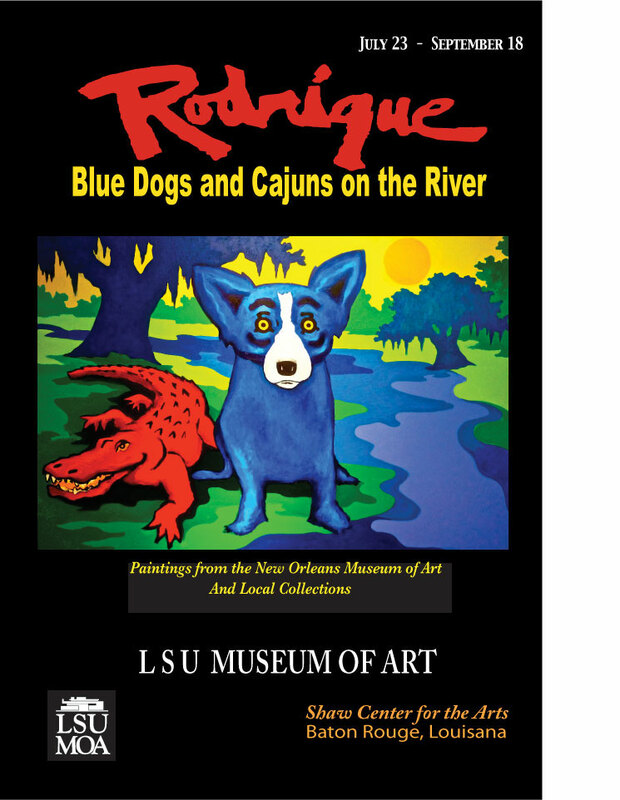 This ambitious fund-raising project coincides with a statewide touring exhibition of original Rodrigue artwork, a series of shows scheduled by the New Orleans Museum of Art based on the museum’s large Rodrigue collection, as well as the success of its 2008 retrospective on the artist. The traveling exhibition started in the summer of 2010 at the Slidell Cultural Center, followed by expanded versions at the Imperial Calcasieu Museum in Lake Charles (detailed along with an insane week of events here) and the Masur Museum in Monroe (story here), as well as a related exhibition of Rodrigue’s Saga of the Acadians at the Alexandria Museum of Art (on view until July 1 and detailed here). 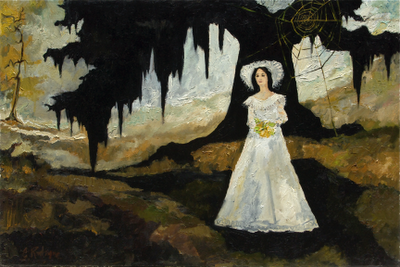 The tour culminates with two large-scale exhibitions in Baton Rouge (at the LSU Museum of Art, July 23 to September 18) and Shreveport (at the Louisiana State Exhibit Museum, September 23 to December 30), both enhanced with paintings from local collectors and Rodrigue’s personal archives. In addition, these shows spotlight sculptural works, including Cajun bronzes from the mid-1970s, large-scale steel, aluminum and chrome Blue Dogs, and unique works of furniture and other three-dimensional items created in 2011 specifically for these exhibitions. 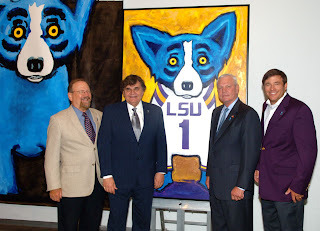 The Baton Rouge LSU MOA exhibition is the first time all five of Rodrigue’s Louisiana Governor’s portraits hang together. 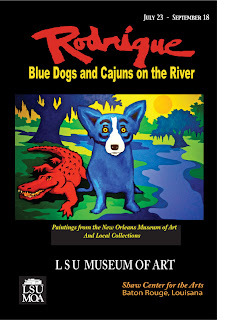 Also included is the first Blue Dog painting, the original painting of Mike the Tiger, the complete Saga of the Acadians, a selection of memorabilia chosen by Rodrigue for this exhibition, and more than seventy original works of art ranging in date from 1969 to 2011. 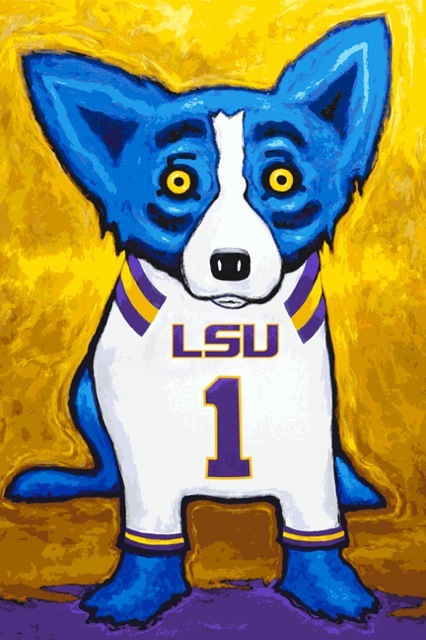 The exhibition’s highlight in both Baton Rouge and Shreveport is the original 6x4 foot painting, A Number One Tiger Fan, on loan from Rodrigue’s personal collection. Signed silkscreen prints from this painting went on sale this week exclusively at the LSU Museum of Art gift shop and at www.arts4education.org, continuing until January 1, 2012. All proceeds benefit arts and education programs sponsored by the Tiger Athletic Foundation, the LSU Museum of Art, and the George Rodrigue Foundation of the Arts. 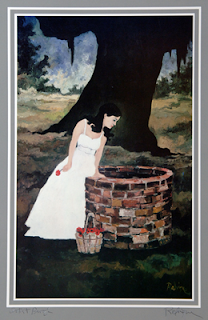 “Clearly,” says George Rodrigue, “the timing was right for this print. Through my new foundation I use the proceeds to provide scholarships, art supplies and a wide-range of support to Louisiana’s arts programs. Related LSU MOA events with the artist include lectures, painting demonstrations, children’s workshops and more, detailed here. I hope to see you all in Baton Rouge this summer and in Shreveport this fall. Thank you, Louisiana! “She created her own world, and I created mine,” explains George Rodrigue to his audience at the Alexandria Museum of Art last week, as he nods from a New Mexico landscape (left of the podium; click photo to enlarge) to his own wet Blue Dog canvas. I made a mental note to remember the line, the nicest thing he’s ever said about artist Georgia O’Keeffe (related post here). 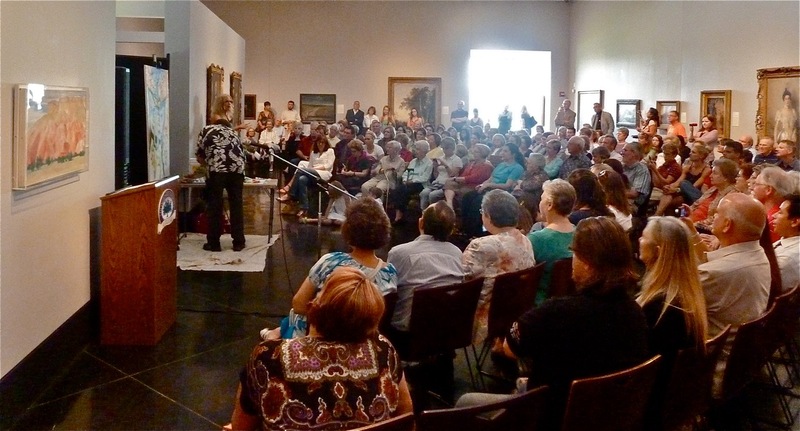 Normally in an auditorium, this unusual painting demonstration occurred within the museum’s largest exhibition space, surrounded by Copley to Warhol, a collection of thirty American masterpieces from the New Orleans Museum of Art (NOMA), on tour throughout Louisiana during 2011 as the museum celebrates its centennial. 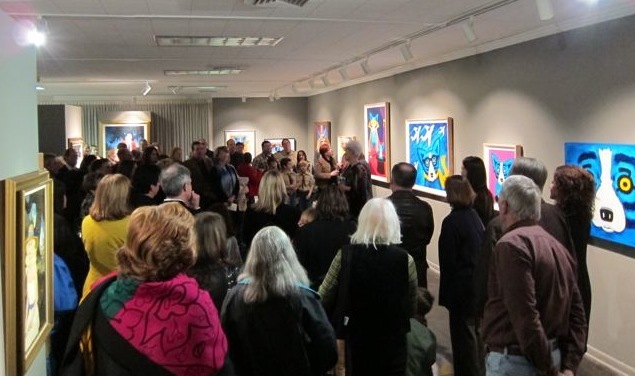 In a bit of irony, NOMA also tours its significant Rodrigue collection this year, an exhibition recently ended in Monroe at the Masur Museum (story here) and opening July 23rd in Baton Rouge at the LSU Museum of Art (story here), followed by the Louisiana State Exhibit Museum in Shreveport this fall. 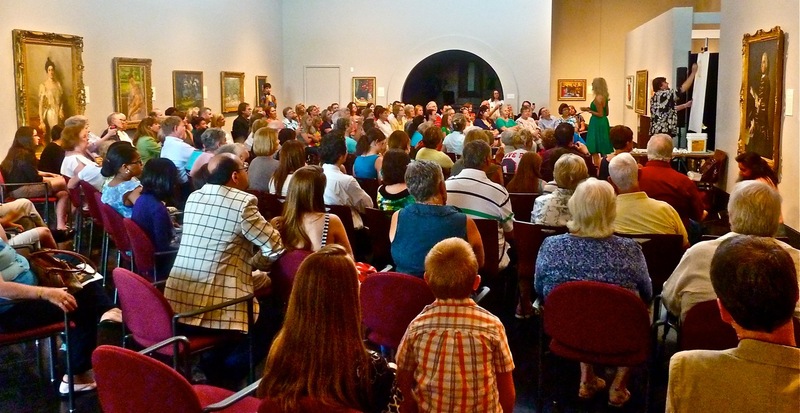 Due to logistical problems, however, Alexandria missed the Rodrigue show. 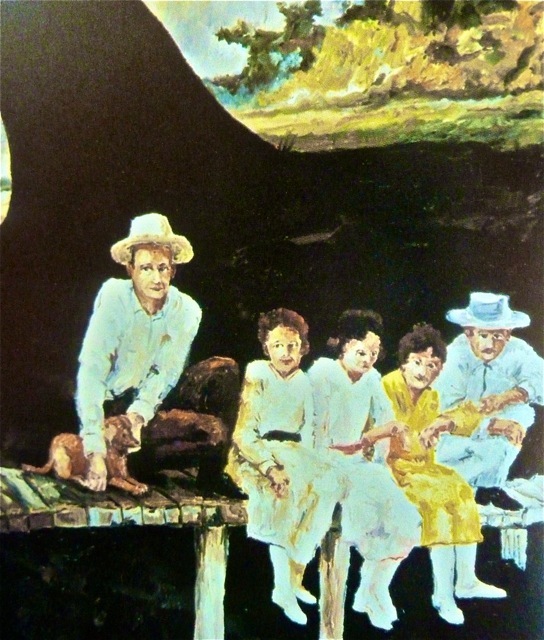 The Anne and Wendell Gauthier family of New Orleans came to the rescue, loaning Alexandria the Saga of the Acadians, a series of fifteen paintings created by Rodrigue between 1985 and 1989. Without an auditorium, the museum’s lecture plans, we assumed, included the small gallery housing these works. 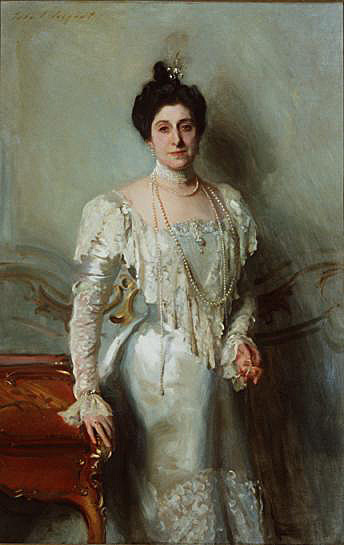 Anticipating a large crowd, the Alexandria Museum of Art had other ideas, however, which is how George ended up nodding to Georgia O’Keeffe, and I ended up speaking in the presence of Mrs. Asher B. Wertheimer, I immediately thought to myself, as the London socialite stared at me from across the room. It was recently that I dove into the scandalous story of John Singer Sargent and Madame X for the post “American Artists in Paris.” Now the elegant Mrs. Wertheimer watched me as though she were the face of art history and patronage, evaluating my delivery and checking my facts. George painted as I shared his story with the audience. He worked quickly, with large brushes and paint straight from the tube, completing a painting in less than one hour for entertainment’s sake, only to repaint it later over several days in his studio. As he turned a blank canvas into something else, I spoke, reacting to the great works in the room. As a young man returned from art school, I explained, George made the decision almost immediately to paint Louisiana. 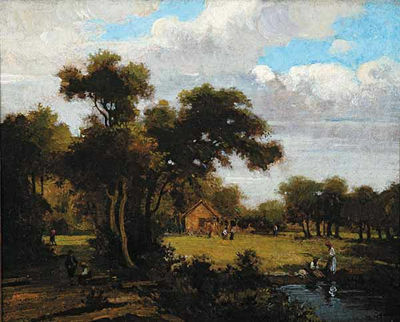 He visited the New Orleans Museum of Art and studied the great masters, especially the Hudson River School. He reacted to the works of Richard Clague, Joseph Meeker and Ellsworth Woodward. 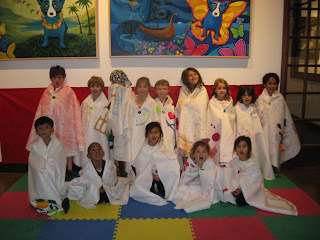 I gestured to the dreamland of visual aides hanging on the wall. The heads turned from George’s canvas, straining instead to see this European style, both the birds-eye view of the classically trained artists and the painted reflections of the Impressionists. For George, this is not Louisiana. He found his own direction, pushing the oak tree to the front of his canvas, cutting it off at the top so that the light shines from beneath its moss and branches, and defining his distinct shape with hard edges. From the beginning, he graphically interpreted Louisiana with hopes of preserving the fading Cajun culture. “The difference between everyday art and great art is that everyday art might look good when you first see it, but after two or three days you lose interest. A man raised his hand. 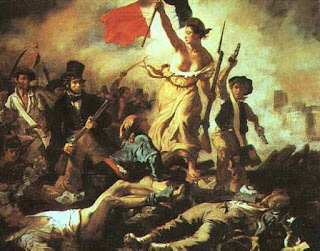 George referenced the walls again, unable to resist the energy in the room, as though America’s greatest artists depended on his answer. “It’s in the artist’s mind, in his approach,” he explained, as he looked towards Warhol, Rivers and Inness. 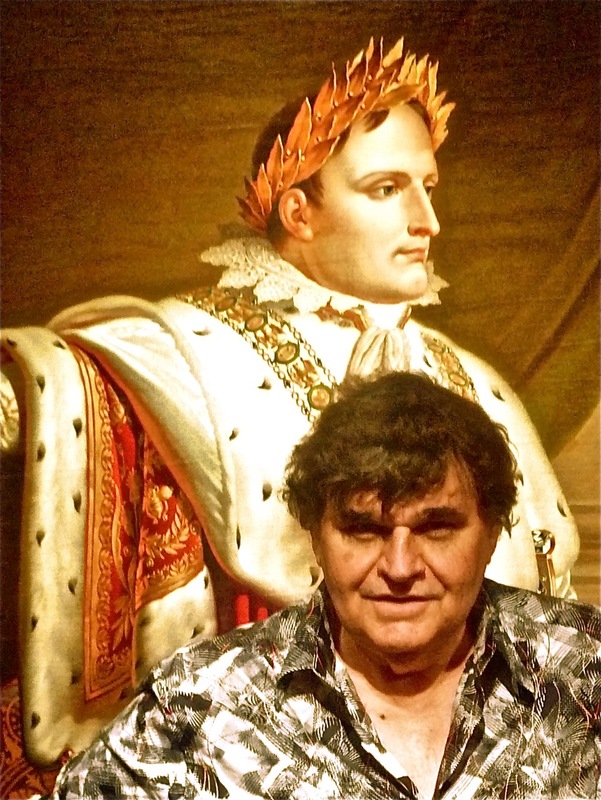 “All of the paintings here look alive. In great art the viewer has a constant communication with the painting, no matter what the painting’s age. Another pointed out a Rodrigue steamboat painting, circa 1972, donated by their family to the Alexandria Museum of Art. He looked again at the masterpieces hanging in the room, pausing with begrudging respect at the O’Keeffe.